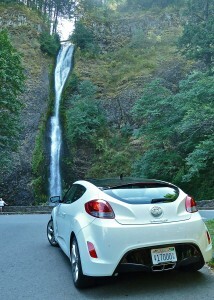 Veloster drew a crowd when we parked at an overlook of the Columbia River Gorge. 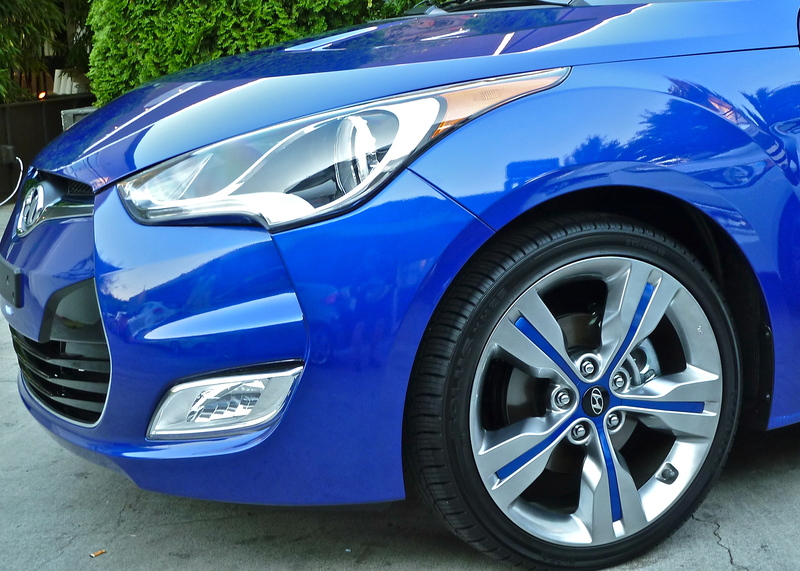 We were driving a 2012 Hyundai Veloster, an unusual car covered with grooves and contours that make it a unique expression of a sports coupe. 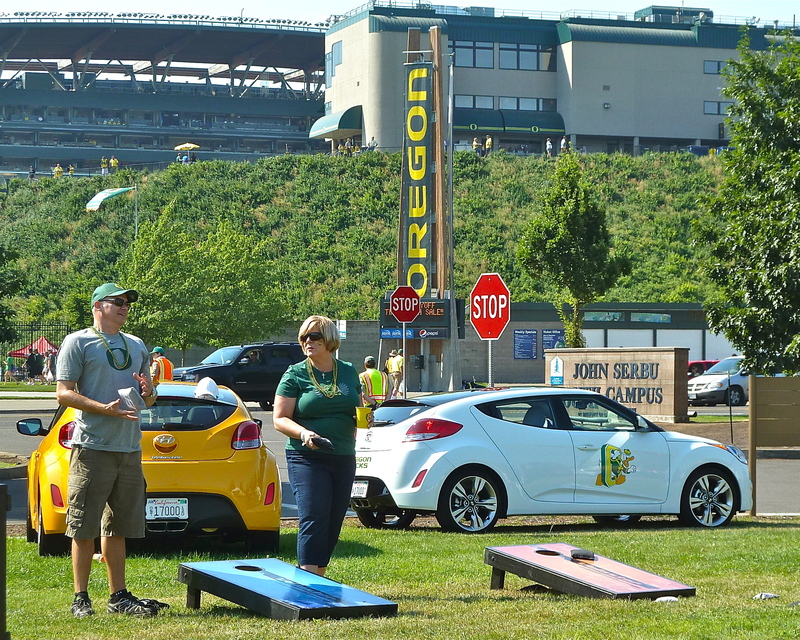 Our day had been consumed by driving down I-5, from Portland to Eugene, where we did a little tailgating and watched the University of Oregon overrun Nevada 69-20 in a college football blowout. On the way down, I had plugged in my iPod and tuned it to Greg Brownâ€™s Iowa folksy songs, singling out â€œEugene,â€ his rambling travelogue about places he likes to visit all across the country, with Eugene, Ore., among them. My partnerÂ enjoyed that song so much he asked me to play it again on our return trip late that Saturday afternoon. Â Alloy wheels have a neat twist, with a strip running down each spoke that matches Veloster vehicle color..
We switched cars to drive both the 6-speed stick shift version and the 6-speed automatic, which isnâ€™t really an automatic but a â€œDCT,â€Â Hyundaiâ€™s ownÂ dual-clutchÂ direct-sequential transmission. With no clutch pedal, two dry clutches inside the gearbox alternate with one handling first, third and fifth while the other engages second, fourth and sixth. If you leave them alone in â€œDâ€ the car shifts with smooth precision; if you click the paddles on either side of the steering wheel, you can manually downshift with the left paddle or upshift with the right one, also smoothly and instantly. 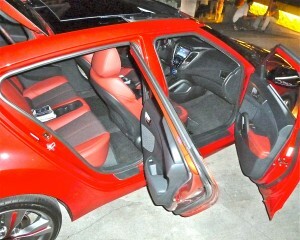 Veloster's third door is hidden on the right side, offering easy rear-seat access. Beyond the Veloster’s name and its multi-grooved shapeliness, its uniqueness includes being a 3-door coupe. 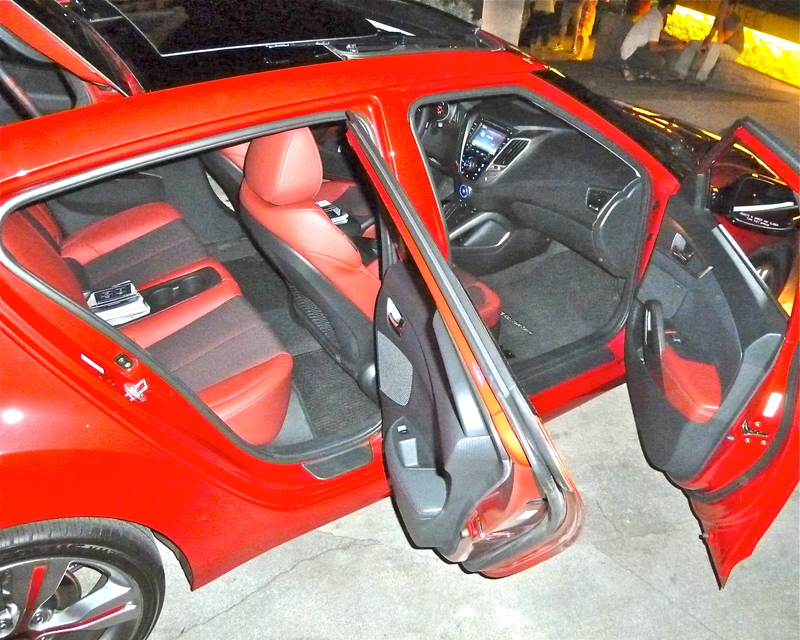 As you approach the driverâ€™s door, you see one large door, and if you approach the right side, you also see one door, though slightly less large to house what you donâ€™t readily see — a second door on the right side, opening with a cleverly hidden hand-grip that is fashioned in flat black to blend into the rear windowâ€™s rear molding. Open it, and you find easy access to a quite-roomy rear bench seat, behind the two supportive buckets up front. The small-displacement 1.6-liter 4 is properly high-tech. Starting with dual overhead camshafts, the all-aluminum 4 has direct injection, which feeds fuel, metered precisely with controlled pressure and temperature, independentlyÂ into each cylinder, a technique that produces optimum power and fuel economy, and also is aimed at eliminating any pre-ignition challenges. The engine has a timing chain instead of a belt, making it maintenance-free, and it has an offset crankshaft to smooth out harmonic vibrations. Electronic throttle control, and variable induction, increase engine performance in all speed ranges. In addition, it has dual variable valve-timing, widening the flexibility range of the valvesâ€™ timing duration, which improves torque. 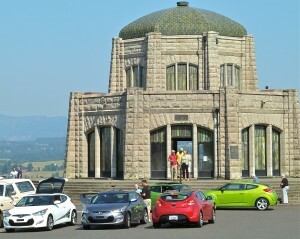 Oregon's Vista House visitor center was surrounded by a flock of Velosters. Volkswagen sells a high-level sporty model of the Golf in Europe, called the Scirocco, and Hyundai engineers say the Veloster is lighter, stronger and stiffer, with a 32.8 Hz. rating compared to the Sciroccoâ€™s 23.1. The firmness equates to a much more tuneable performance suspension, without any harshness, while helping the Veloster to the No. 1 rank in its class for wind noise, road noise and both low and high frequency noise intrusion. Washington contributed a scenic waterfall to the Veloster introduction. 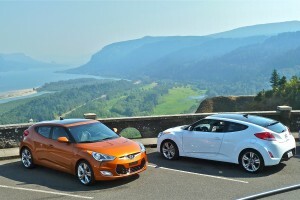 While the Veloster borrows the 1.6-liter GDI Gamma engine from the Accent, its platform is based more on the longer Elantra, which adds weight and stability, but means the Veloster canâ€™t match the Accentâ€™s amazing fuel economy, which starts out at 40 highway and reached and observed high of 47 during our introductory highway tests a month earlier. After the Sonata, Veloster is Hyundaiâ€™s second vehicle to have blueLink, which might overmatch the connectivity benefits of most competitors. Among its more elementary operations are finding points of interest, gas stations, and restaurants, and alerting you to daily traffic congestion ahead, weather issues, as well as route guidance. I suggested if Hyundai is that advanced, perhaps the next step in retrieving a stolen Veloster would be to slow down and stop the car, then tighten the seat harness and disable the unlatch feature, then lock all the doors to keep the perpetrator inside until the cops arrive. We may not want Big Brother watching us, but we sure wouldnâ€™t mind him watching over our cars. 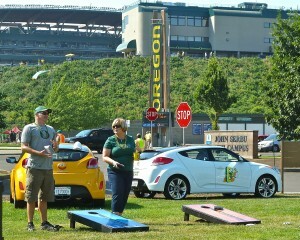 Tailgating party featured Velosters, and media-types flinging bean bags, before Oregon crushed Nevada 69-20. Along with all the impressive connectivity outlets, you can play some economy games with your Veloster, switching the instrument screen to eco-drive information, or you could go to BlueMax, which will keep score of how well youâ€™re driving for optimum fuel efficiency. Because it handles so well and is so fun to drive, you may be tempted to keep stepping on the gas in the Veloster more than optimum fuel economy might allow. But appearances can mean a lot. 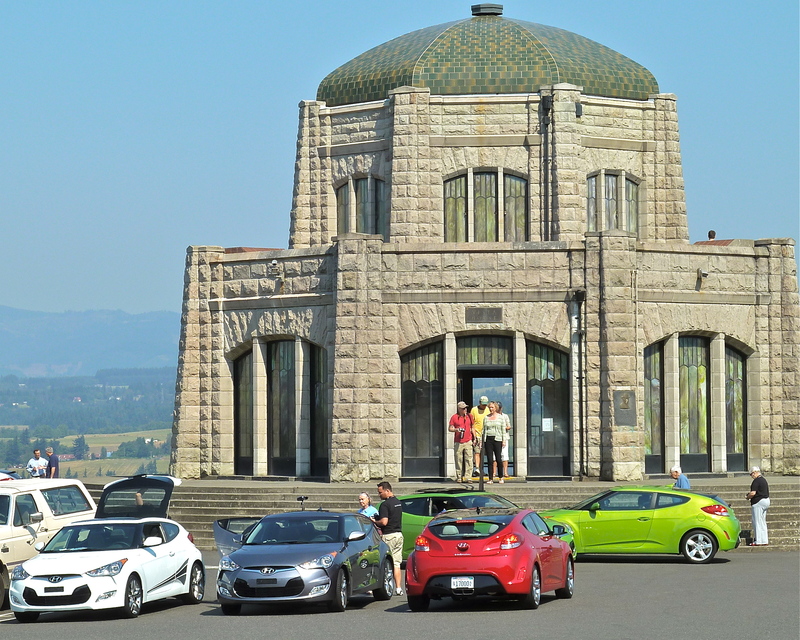 Passers-by at a rest stop arenâ€™t likely to surround just a boxy subcompact, and you wonâ€™t find SUV drivers on the interstate jockeying for position and risking life and limb to snap a cell-phone photo of just any 40-mpg sedan.